Bontemps starred in every level of basketball and his teams were always champion ones which looked to him as their leader. He first gained attention as the key member of the legendary Taylorville High School team of 1944 which compiled a remarkable 45-0 record in racing to the Illinois State Title. He achieved similar success at Beloit College and gave the small Wisconsin school a national reputation in basketball. A versatile athlete who was an excellent shooter, an accurate passer and a solid rebounder, Bontemps controlled all facets of the game and often dominated a game from start to finish. But perhaps his greatest strength was his ability to inspire and motivate his teammates and thus serve as a "coach" on the floor. 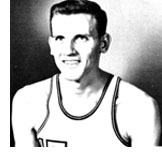 Bontemps also was one of the greatest players in Caterpillar's illustrious basketball history, having paced three of Cat's National AAU teams. He also was a key member of the 1952 Olympic basketball team which won the coveted Gold Medal with a stunning victory over Russia in the title game.